Look, I'll order anything from a kid participating in a fundraiser. I just will. As a kid I knocked far too many doors to not have major empathy for these kids peddling WHATEVER in order to assuage their costs of getting to go to camp or win a pizza party for their class. Scooby Doo scented markers? A set of 5 for $7.50? I'll take two! Thing is, no one does this anymore. Parents got wicked sick of kids asking them to buy stuff, of their own kids knocking on doors begging parents to buy stuff. My own kids participate in fundraisers for their extracurriculars, but their school prides itself on not holding any fundraisers. I'm not saying that Having Fundraisers or Not Having Fundraisers is the correct way to go, I'm just saying that if a kid asks, I'll buy. As an adult I think I've been approached by Girl Scouts maybe once or twice, or maybe never, for the purpose of being asked if I'd like to order any boxes of cookies. This has troubled me. I've seen the tables set up outside the grocery stores in March, with the girls and their leaders and their dogs yelling about ONLY THREE-FIFTY A BOX! but it's not a very reliable system: When will they be there? Which stores will they frequent? Will I have cash on hand that day? Most importantly, will they even HAVE any Samoas? One year I was so desperately craving a certain flavor of cookie that I actually drove around my city, to all the grocery stores I could think of, parking my van, getting out and running (yes, running) to the Girl Scout Cookie table to see if they had my flavor of choice. I was too late. Always too late. And I wasted about 45 minutes. How thrilled was I to receive an email from my friend cabesh, whose daughter is a Girl Scout where they live, in Stars Hollow, asking if I'd be interested in ordering any cookies! Two time zones wasn't going to stop me! No, that girl was getting my money to help her go to camp BECAUSE SHE ASKED. I received the box of 10 boxes of cookies in the mail two days ago. I don't have any pictures because I had to quickly store the cookies in the locked freezer in the garage before anyone saw them. They tread that fine line between being rationed and being pilfered. Do you have any cookies to celebrate this GirlScoutCookie Season? Lucky for me, I have an office job. And kids with parents who have office jobs are pretty much the only ones who seem to do fundraisers anymore ... because their parents can bring the sign-up sheets to work and stick them in the break room. Low pressure shopping. I've got three boxes of Samoas and two of Thin Mints coming my way soon. They won't last three days. I think it takes a lot of courage for little kids to approach adults and try to sell something. I know I was terrified to do it when I was little (but Jump Rope for Heart was worth it). That kind of bravery should always be rewarded. Also, I am a thin mint girl. Thanks for making me crave them. Can I come over and eat some cookies? I'm a Tagalong girl. Do you only have Samoas? Cuz those are gross. I'd break into your freezer for some thin mints or Tagalongs. I buy everything kids ask me too. Even coupons to restaurants I'll never go to! What can I say? I just went to the girl scouts website and entered my zip code and email address, and then someone local sent me a list of where they'll be and when. Which reminds me, I think today might be the day...Woopwoop! I have the same problem. It's been like 3 years since I've had a girl scout cookie, and hearing about them just kills me! First of all , no on fundraisers. I am the mom that politely says no to everyone. Except my kids. Then it's heck no. I too go in search of cookies. Have not seen one box yet! 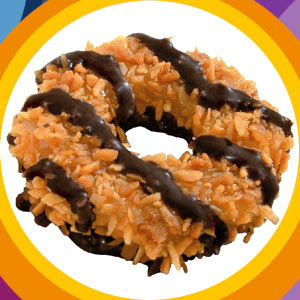 And I guess the name Samoas was politically incorrect and they are now called Carmel Delights. Whatevs. I'll buy anything, too. And I never get asked to buy Girl Scout cookies. And I always wish I had some Samoas this time of year. Is it too late to buy some? Only ten boxes? Seriously? That wouldn't last a week in our house. Oh, and I sneak them too...a few in the freezer and a few in my hidden stash of snacks way in the back of our cold storage. I remember the good ol' days of knocking on doors. My favorite was selling these super nifty outdoor thermometers that suctioned to your window. They came in multiple designs like red robins and sunflowers. Of course I much prefer eating Girl Scout cookies and cookie dough (my girls' school does the cookie dough thing) to thermometers, so I'm glad they aren't peddling those anymore! I'm a big believer in the "buy stuff from kids" rule, especially when I drop $1 for the .25 lemonade in the summer! We've been lucky enough to have a girl scout for the last 2 years, but she starts middle school next year, so we'll have to talk the next daughter into doing it (come on, do it for the cookies!!! ), either that or I'll be tracking down the girl scouts just like you! We have 4 girls from 2 competing Girl Scout troops in our neighborhood who come by every year and I always buy from them all. Why do I choose Samoas? Because they sell close-enough duplicates of every other kind at the grocery. When I get my 12 boxes they are promptly hidden in 12 different locations throughout my house - one such location being a place where the kids can find them and think they're onto my stash. Here's another question: why have you gotten some in the mail already and I have not gotten mine yet?! I never have anyone coming by selling cookies either! And I LOVE LOVE LOVE girl scout cookies. I think my girls will have to be girl scouts before I'll get to order any. But I'm the same way about kids selling stuff. I'll always buy. My pet peeve is the lemonade stand on the street - I ALWAYS stop. Even if its the nastiest stuff on earth, I want to reward the kids for their effort. I also have a soft spot for kids selling things but I'm beginning to think I need a new rule: Only buy from kids I know. About 4 months ago I took pity on the neighborhood scout troop and bought some seriously overpriced popcorn. They have yet to deliver. The problem is that I don't remember who the little boys were. They live around here, but I couldn't tell you where exactly. I just want my popcorn. i buy stuff from kids, too. but i've never been crazy over gs cookies. there must be something wrong with me. but if you're into cookie dough, my daughter is currently selling that. i'm pretty sure we're just going to eat that right out of the tub. Now that Chloe is a girl scout our access to cookies is WAY to easy--I won't even tell you how many boxes we've gone through. I love tagalongs, but can only eat so many....for an indulgence I do better with thin mints. Anyone on here who wants to order from Chloe, just email me. I too, buy Samoas because I love them and can find similar duplicates in the stores. We have a cousin who joined girls scouts this year so of course we ordered lots. I am proud to say, though, that we just ate some cookies from last year. Here's to self control or maybe just forgetfulness as to where I hid them. I bought a couple of boxes from a very aggressive grandma down the street, selling for her grandkids. She told me that in order to go door to door, they have to have an adult (until a certain age-then they have to go with two girl scouts) and they are only supposed to go to people they know. They also have to sell 100 boxes, which is why they set up shop outside stores and on corners. Just in case you were wondering. I was "smart" enough to volunteer to be cookie mom for my daughters girl scout troop. Basically what this entails is 100s of boxes of cookies being stored in my living room. My self control is disintegrating rapidly. FYI: You can go to http://cookielocator.littlebrownie.com/ to locate a cookie booth near you. Maybe that will save someone else 45 minutes of driving time. I bought some cookies last year from some girls who knocked on my door. I gave them my money but they never brought me my cookies. I've been waiting all year for those Thin Mints! Just stopping by from MMB to say hi :) We just bought some somoans from the the girl scouts yesterday :) Yummy. Yes, I have them! My coworkers have little female people in their houses. And in a few years, I hope that mine will also partake in this cookie ritual. Mu-ha-ha (my evil laugh.) Perhaps I was meant to have girls for this reason alone! I love girl scout cookies- I order them through co-workers. Last year I missed the ordering deadline and had to find them on my own. The girl scouts website will tell you when they are supposed to be at certain stores, but if they have run out of their stash- you have to drive to the next location. I consider my case of Samoas as food storage. I'm with you on the rationing. Of course I did quickly down a box throughout day 1 of having them.